Unlike the activities of Summer, Winter at Wyalusing State Park is a time of solitude. A time to dream. Yes, it's cold and often windy outside. And, yes, you're feeling the temptation to hibernate in front of the fire. And winter still has a long way to go. That temptation may only get stronger. 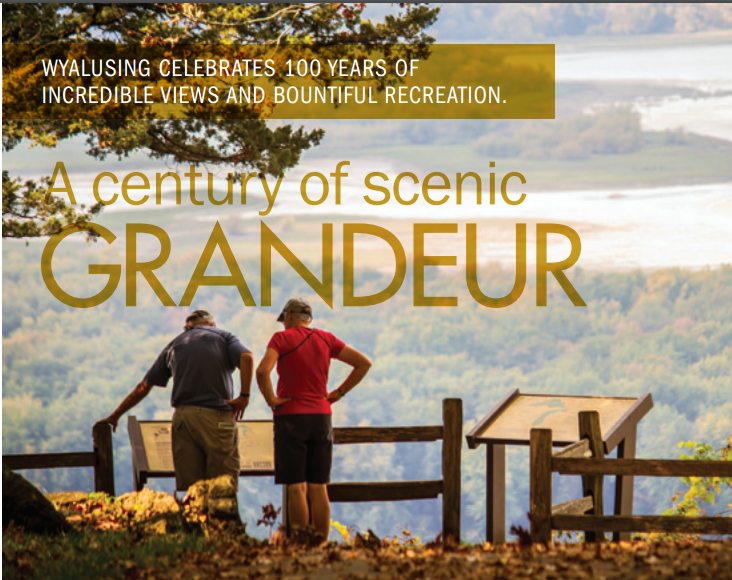 At least for one day, resist that temptation, take a drive to Wyalusing State Park. As of this writing, a fresh coating of snow blankets Wyalusing State Park. The main park roads and parking lots are plowed. Dress warmly, wear boots, walk carefully to Point Lookout. (The blacktop trail may even be plowed.) Enjoy the sights. Without leaves, the views are breathtaking. Bluffs not seen during the summer, are revealed during the winter months. As a bonus, the winter visitor does not have to contend with insects. Picture Rock Cave is a sight to behold. The gentle water fall, seen in the summer months, turns into giant mouth lined with icicles welcoming the unwary winter visitor. The walk to Picture Rock Cave is a challenge. Homestead campground road is not plowed. Park at the main office. From the main office, walk up the road to Homestead campground, then take the road to the indoor group camp to Homestead picnic area. From the unplowed parking lot, take the trail to Picture Rock Cave. Needless to say, the trail is snow covered. As of this writing, the snow was knee deep in spots. A walking stick will be helpful. Snowshoes came in handy. The round trip is about two hours. Snowshoeing on the Sugar Maple Nature Trail is a walk through Wyalusing’s Winter Wonderland. 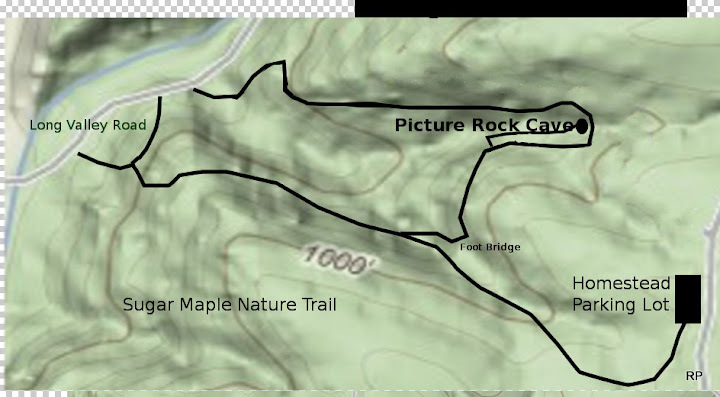 Without snowshoes, or cross country skis the walk along Sugar Maple Nature Trail to Picture Rock Cave may be impossible. The author’s daughter and her companion, from the Netherlands, chose this route. The two were conveyed to the junction of Sugar Maple Nature Trail and Long Valley Road. The two snow shoed the trail to Picture Rock Cave. The trail was a steady uphill climb. At mid-point, they took the foot bridge across a ravine to Picture Rock Cave. The trip resumed across Homestead picnic shelter, and down Turkey Hollow Trail to the office where they were picked up. The trip took about two hours. Long Valley Road is plowed.